Universal Machine and Engineering’s skilled professionals in the electrical, mechanical, and machine design fields have an average of 25 years of experience. 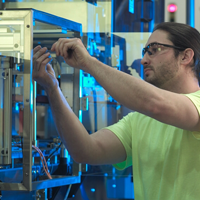 Our engineering and design teams have the: vision, proven ability, and creative talent to design equipment that will put your company ahead of the competition.Universal Machine’s team of engineers work closely with our customers to carefully assess the customer’s needs and evaluate the problems they are encountering. We then provide the assistance required to design the appropriate system for any given application. 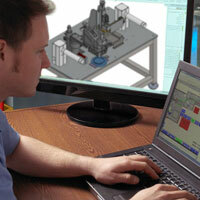 After the design proposal is reviewed and accepted, our engineers develop final drawings and carefully monitor every part of our custom solution as it passes through manufacturing, assembly, quality control and initial start-up, assuring that a Universal Machine solution meets or exceeds all of the client specified requirements. Each process in the design, build and testing stages stays in-house to further assure quality and guarantee an on-time delivery. Universal Machine’s experience and in-house capabilities provied your company with an unmatched automation experience. When your company is ready for a world-class automation design and build experience it’s time to contact the team with more experience and the most capabilities, UNIVERSAL MACHINE!